← Leeds – council on collision course with unions over new terms and conditions? There’s a space for you to make suggestions or comments. I couldn’t find a list of how the cuts will affect each library, so here’s one I’ve put together. What’s the rationale for how the cuts have been targeted? 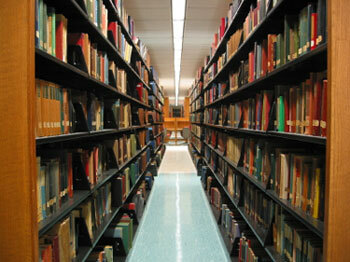 Well, they’ve carried out a library by library analysis to identify when the quietest hours are. 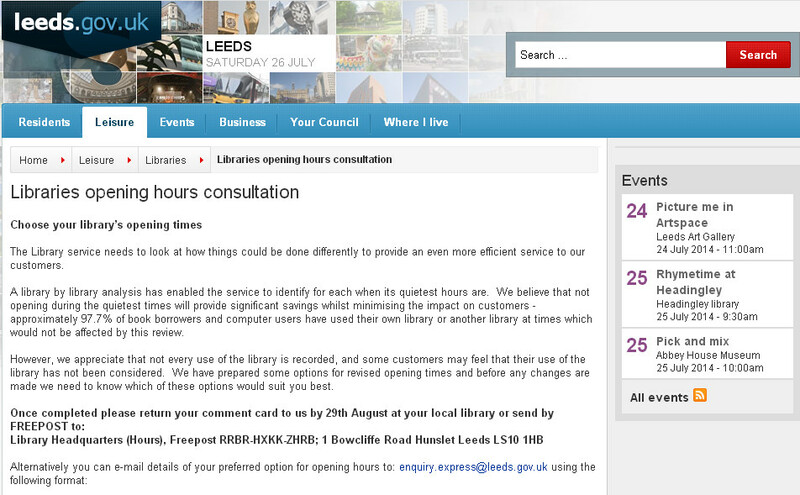 “We believe that not opening during the quietest times will provide significant savings whilst minimising the impact on customers – approximately 97.7% of book borrowers and computer users have used their own library or another library at times which would not be affected by this review,” they say. As often happens with decisions like this, the data collected in the review hasn’t been made public. One of the things they’ll have borne in mind too, one imagines, is how many people have been using each library since the 2011 reorganisation in the city, which saw 13 libraries axed. 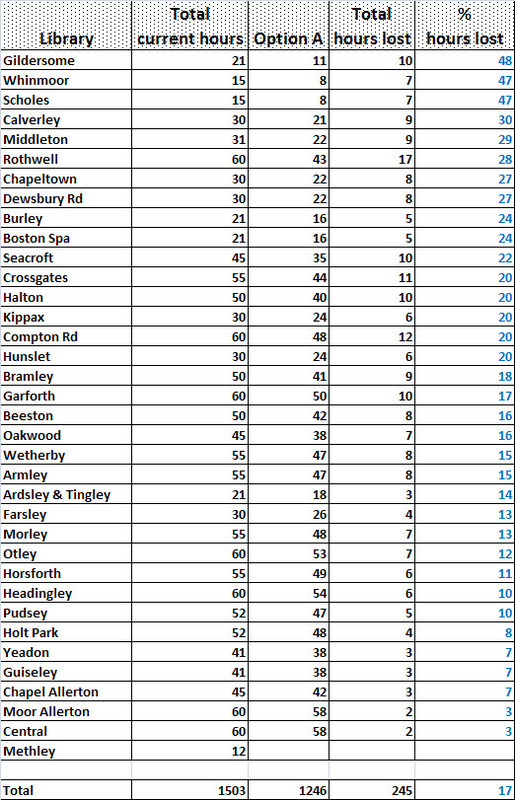 So, there’s another list below showing how each library performed in the first two years since the reorganisation (taken from Leeds Data Mill). They’ll have figures for 2013-14 at their disposal, but they haven’t been published yet. 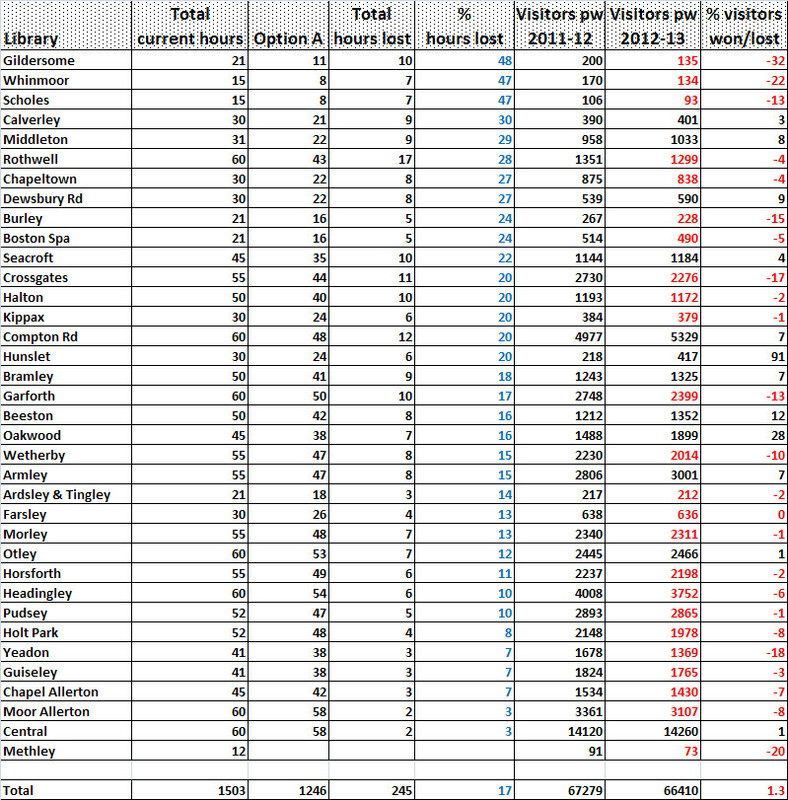 A couple of observations: a library like Yeadon that lost 18% of its visitors in 2012-13 is having 7% of its hours cut, while Dewsbury Rd, which saw a 9% increase in visitors in the same period is facing a 27% cut in its hours. You have to ask yourself what future there can be for a library like Scholes, which had only 93 visitors a week in 2012-13, and is now facing a 47% cut in its opening hours (down from 15 to 8 per week). There’s a campaign to fight the cuts already under way in west Leeds, backed by local MP Rachel Reeves. I haven’t heard of anything similar happening elsewhere. Let me know if you hear if there is, please. Here’s the list. The figures in red represent a fall in visitors (“pw” means per week). This entry was posted in Uncategorized and tagged cuts, leeds, leeds city council, libraries, opening hours, Rachel Reeves. Bookmark the permalink. Bradford proposed closing Denholme library (bless ’em). 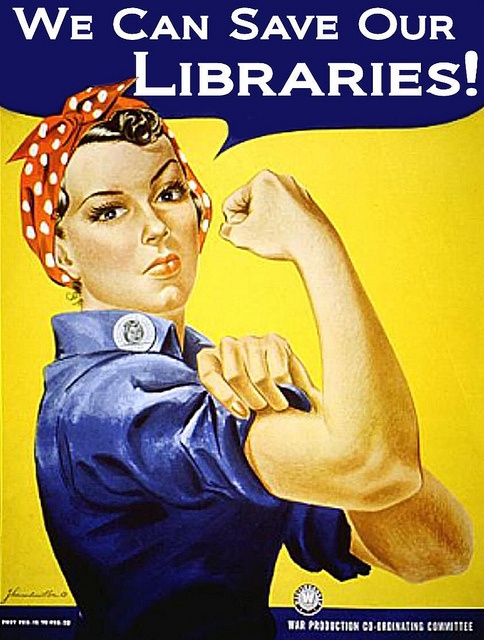 Community took over – now have longer opening hours, all voluntary, ‘our library’ stuff.